News > 2016 > Over 600 scholarships in the winter 2016 term! Over 600 scholarships in the winter 2016 term! 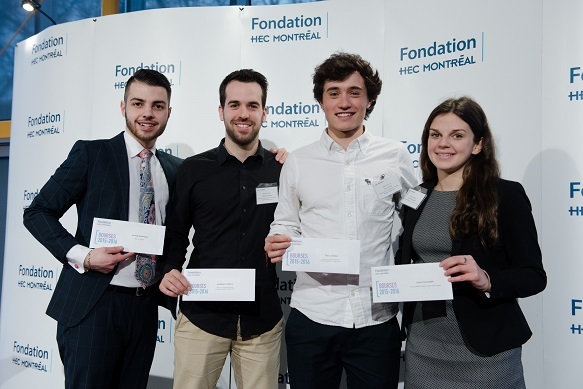 The excellence, commitment and entrepreneurial spirit of HEC Montréal students were saluted at four scholarship ceremonies in April. Thanks to the generosity of many donors, the Fondation HEC Montréal awarded $1,600,265 in scholarships to 615 students in the winter 2016 term. To see these students in action, take a look at the photos from the ceremonies and the video of the scholarship winners’ surprised reactions. The fifth and last ceremony is planned for May 25 (see photos). Congratulations to all the scholarship recipients, and huge thanks to all our donors! Some of the scholarship winners at the April 12 ceremony: Razmig Boussouyan (Kruger scholarship); Guillaume Campeau (Rachelle and Alain Paris scholarship); Théo Corboliou (Rachelle and Alain Paris scholarship); Laurie Doré-Ouellet (Diane and Jean-Pierre Gagné family scholarship). Photo: Sylvie Trépanier.